Johann Sebastian Bach was settling into his job as Cantor of St Thomas’s Church in Leipzig, which entailed composing for services, teaching music, arranging the church’s musical life, and raising his numerous children. That was obviously not enough, because he accepted a commission from the students of the university to write a cantata for the name day of their much-loved law professor, August Friedrich Müller. The short secular cantata Der zufriedengestellte Aeolus, to a libretto by Christian Friedrich Henrici, hinges on the quirkily anachronistic premise that the goddess Pallas Athene needs to dissuade the storm god Aeolus from ruining Professor Müller’s festivities. She enlists the aid of Zephyrus. 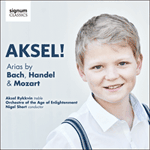 Bach must have liked the aria, since he recycled it four years later for a sacred cantata. Soll auf meinen Höhen spielen. should play on my mountain heights.